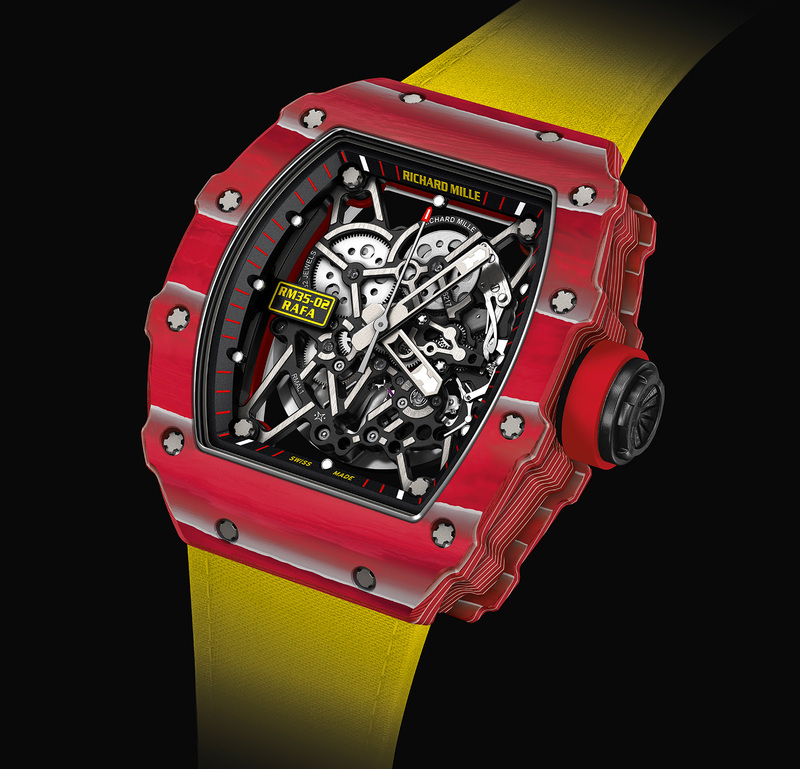 In the eight years since Richard Mille recruited Spanish tennis champion Rafael Nadal as a brand ambassador, the Swiss watchmaker has conceived a string of ultra-light wristwatches for Rafa to wear on court. 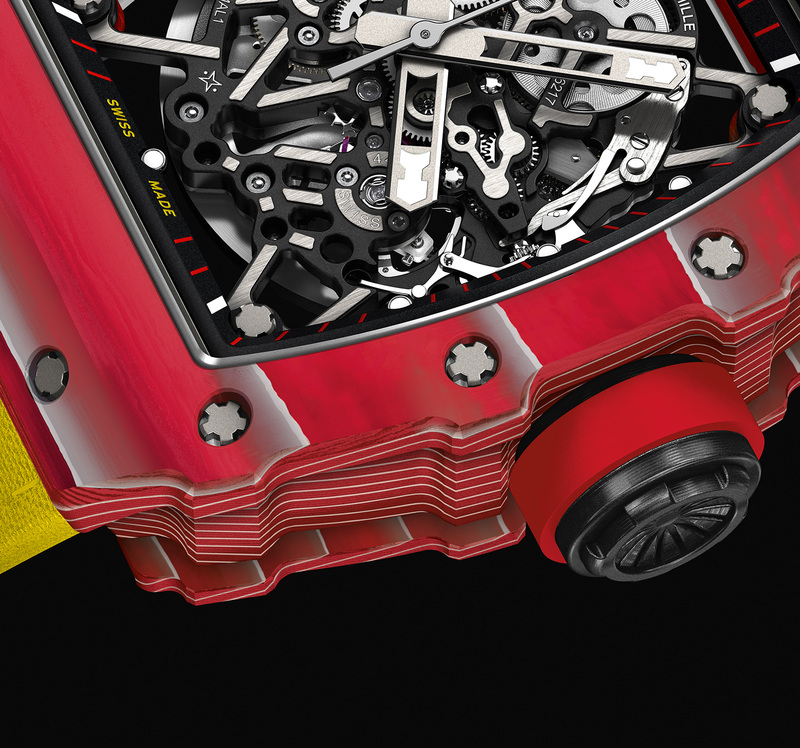 A year after the US$775,000 RM 27-02 Tourbillon, Richard Mille has announced the RM 35-02. 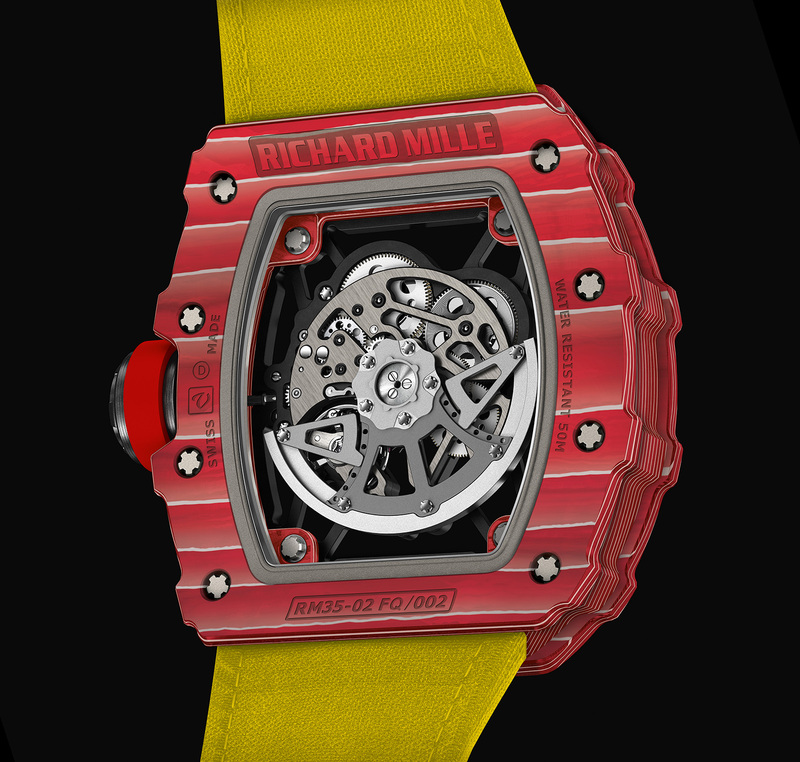 Like many other Richard Mille watches, the case of the RM 35-02 is made of a high-tech carbon composite – either black NTPT Carbon or Quartz-TPT Red. Made by Swiss materials specialist North Thin Ply Technologies (NTPT), these composites have a distinctive striped surface that’s a result of the layered sheets of carbon inside. Because the blocks of material are machined against the grain, the result is the striking motif on the case. The case is a largish 49.94mm from top to bottom, and 44.5mm wide. Thickness is 13.15mm. Inside is the calibre RMAL1, a self-winding movement made by Vaucher. Its bridges and base plate are made of titanium, coated in black and partially open-worked, in typical Richard Mille style. In terms of technical features, the calibre has double barrels (power reserve 55 hours), a free-sprung balance wheel, as well as a rotor with variable winding efficiency (to cater for the wearer’s physical activity; Rafa presumably needs the lowest setting). The RM 35-02 is priced at approximately US$145,000 or S$200,000. Correction June 4, 2016: Edited to state movement is made by Vaucher.